What are the most popular online bachelor's degrees offered in Michigan? Michigan offers some of the best online college programs in the country, and the state has been a long time supporter of online learning. Beginning in 2006, Michigan mandated that all students must take at least one online course or learning experience before graduation. As a member of the Midwestern Higher Education Compact (MHEC), Michigan has opened its doors to regional out-of-state students through a tuition reciprocity program. In the program, public schools charge out-of-state students no more than 150% of the in-state tuition rate, and private schools must offer a 10% reduction in their standard tuition price. This offer -- along with the flexibility to take courses from affiliated schools, and a simple transfer process -- demonstrates Michigan's commitment to online learning. In addition to MHEC, those interested in an online education should look into Michigan Colleges Online. MCO is composed of 28 community colleges across the state, and the organization allows students from any one of these schools to take online courses from other members through a simple enrollment process. All credits that students earn at the partner colleges transfer back to their original school. In their 2012 report, the National Center for Education Statistics (NCES) estimated that 78.6% of students pursuing online degrees in Michigan lived in-state. Residents will find ample grants and other financial aid from the state to help them pursue their education affordably. Michigan State’s East Lansing campus served as the original prototype for all U.S. land-grant universities, and MSU was also the first school to offer formal instruction in scientific agriculture. Today, MSU’s 40,000 students can pursue degrees in more than 200 programs of study. Among online colleges in Michigan, MSU stands out for its comprehensive distance learning offerings, particularly at the postbaccalaureate level. Registered nurses who hold a two-year degree may complete their bachelor of nursing degree entirely online, and the bachelor of arts in early care and education is offered in a hybrid format that blends online and traditional classes. Graduate students can also pursue several degrees. The school offers master’s degrees and graduate certificates across a range of disciplines, including education, biomedicine, criminal justice, physics, social work, and more. Doctoral degrees in physics, nursing, or educational technology are also available. MSU delivers its online education through the Desire2Learn platform; classes follow a traditional semester schedule, and courses are taught asynchronously. Michigan’s main campus in Ann Arbor educates nearly 30,000 undergraduates per year. The public school is known for its selectivity, accepting only 26% of freshman applicants. Distance learners have a few options at Michigan. UM’s College of Integrative Systems & Design hosts five online graduate degree programs in engineering, while the School of Public health offers an executive master’s degree in public health or health services administration. For professionals in dentistry, licensed dental hygienists who hold an associate degree can complete a bachelor’s degree in dental hygiene online; the master of science in dental hygiene is also offered in a distance format. Online programs are managed by their specific departments; though most courses are taught asynchronously and follow the university’s semester calendar, individual program requirements may vary across departments. Founded in 1922 and based in Troy, Michigan, Walsh College is a school that primarily focuses on business, accounting, finance, and information technology. The university offers three online degrees: a bachelor’s in accountancy, business administration, and information technology. Online courses are taught asynchronously. Each program uses a blended learning model, combining online coursework with on-campus classes that maintain a small student-to-faculty ratio. Students may specialize their degree by choosing a minor in accounting, management, finance, marketing, or information technology. Walsh is among transfer-friendly online colleges in Michigan, allowing community college transfer students to apply up to 82 credits. Transfer students who previously attended a four-year college may bring up to 91 credits. Each online degree at Walsh is a completion program, so applicants must have completed at least 60 college credits with a minimum GPA of 2.0. All learners pay the same tuition, regardless of residency. Madonna University, a Catholic-affiliated liberal arts school outside of Detroit, operates satellite campuses throughout Michigan. The school offers 15 of its undergraduate, graduate, and certificate programs online, which do not have any in-person requirements. Coursework is delivered asynchronously. The school’s online bachelor of science in nursing program offers an accelerated track that allows students to graduate in 16 months. The school also offers individual courses from other programs online. Madonna prefers freshman applicants to have earned a minimum high school GPA of 2.75 and a minimum ACT score of 20. Transfer applicants must have completed at least 12 college credits with a minimum GPA of 2.0. Similar to other online schools in Michigan, Madonna charges each online student the same tuition, regardless of their location. CMU is home to more than 20,000 students per year. Campus-based students can pursue a degree from more than 200 academic disciplines, from associate programs to doctoral degrees. CMU Online, the university’s award-winning distance education arm, educates an additional 7,000 students. This public school takes a comprehensive approach to online education, and offers multiple solutions for non-traditional learners. The school provides 18 degree programs at the baccalaureate, graduate, and doctoral level, all of which are available entirely online. Undergraduates can earn a bachelor’s degree in administration, community development, education, engineering technology, leadership studies, political science, or psychology; distance learners may also take classes in an accelerated format that can lead to a bachelor of science and a master of science in five years. Students interested in postgraduate or doctoral study also have several entirely online programs from which to choose; these include the specialist in education (Ed.S.) degree that qualifies graduates to sit for the Michigan educational administration certificate. This online college in Michigan manages its online classes through the Blackboard learning management system. All courses are taught asynchronously. UM’s Dearborn campus is far smaller than the flagship campus in Ann Arbor, and is home to about 7,500 undergraduates annually. The school offers distance learners 16 fully online graduate degree programs, all of which are designed for working adults. Engineering professionals can earn postbaccalaureate degrees in several subspecialties in their field, including automotive systems, management, energy systems, industrial systems, and more. Educators can pursue master’s degrees in educational technology or special education, while business professionals may opt for advanced study in finance, business information, or information systems. UM-Dearborn uses the Canvas learning management platform to deliver its distance education curriculum. Courses are generally taught asynchronously, though some professors may require occasional time-sensitive log-ins. Northwood was founded on the concept that any successful enterprise requires strong management. This private business school operates a residential campus in Michigan’s Upper Peninsula, educating about 4,000 students per year. NU’s offerings for adult learners also include a number of online degree programs in business disciplines. NU students can earn a bachelor of business administration while pursuing one of 11 concentrations. The curriculum allows distance learners to customize their studies to a particular industry or skill set within the field. Among them is the franchising management major; NU is the first and only accredited school in the US to offer this program of study. The degree is available entirely online, though Michigan residents can take classes in a hybrid format at one of NU’s 13 satellite facilities. Online students in Kentucky, Texas, Louisiana, and California may also blend online classes with in-person courses at regional NU locations. All Northwood classes are taught in eight-week blocks, and students may begin taking classes at multiple points throughout the year. Up to 30 hours of transfer credit may be granted for prior learning experiences. Named for a Seventh-day Adventist missionary, Andrews University is an award-winning private school in Berrien Springs. Home to approximately 3,300 students annually, Andrews has a low 10:1 student-to-faculty ratio. As a Christian university, the school integrates theological study into its general education curriculum. Andrews also has a robust online platform. The school’s online undergraduate offerings include three associate degrees, along with bachelor’s degree-completion programs in religion, aviation, communications, and general studies. Graduate students have several options as well,with master’s and doctoral programs in business, education, nursing, and more. While most coursework can be completed online, some graduate programs require students to occasionally commute to campus. Like other Michigan online colleges, Andrews manages its distance education programs through the Moodle platform. Courses are taught asynchronously, and classes follow a semester calendar. This small private university is affiliated with the Free Methodist Church, and the school delivers a liberal arts education from a Christian perspective. Spring Arbor offers traditional students associate, bachelor’s, and master’s degree programs in almost 100 areas of study. SAU’s online degree programs include a bachelor’s completion program in nursing, a bachelor’s degree in organizational management, and 12 master’s programs. Nursing professionals will be particularly interested in SAU: in addition to its RN-BSN program, students can earn one of six MS in nursing degrees entirely online. All distance courses at SAU are offered in seven-week blocks, and classes are delivered asynchronously. Where applicable, distance learners are expected to arrange to complete on-site curriculum requirements at an approved facility. Siena Heights operates a main campus in Adrian and eight satellite facilities throughout the state. SHU’s campus-based undergraduate and graduate students pursue liberal arts degrees in one of 100 programs. Distance learners throughout the U.S. and Canada can take advantage of SHU’s award-winning online learning programs, all of which were designed specifically for working adults. Professionals who have not attended any college may opt to earn an associate of arts in business administration or multidisciplinary studies. Students who have an associate degree or its equivalent can pursue bachelor’s degree-completion programs in nine areas of study. Campus-based students may also augment traditional classes with online minors in management, marketing, healthcare management, or information technology management. This online college in Michigan delivers its web classes in accelerated eight-week sessions. Most courses are offered asynchronously, though some instructors may require occasional synchronous online participation. Lying in the Upper Peninsula adjacent to Lake Superior, Michigan Technological University is known for its academically rigorous programs. Over 7,000 students attend class on its sprawling campus, where they can pursue bachelor’s or master’s degrees in technology, business, engineering, environmental science, or liberal arts. For distance learners in the United States, MTU offers eight post-baccalaureate programs entirely online. Students in eligible states may pursue an online graduate degree in engineering, science education, geospatial technology, and medical informatics. These flexible programs allow students to pursue their degree through a thesis or non-thesis option. Other requirements, such as practical experiences, may be substituted for a design project or other coursework. Distance learners can also pursue various certificate programs and a PhD in mechanical engineering online. This Michigan online college delivers classes through Canvas. Most classes are taught asynchronously, and some professors choose to livestream their courses for distance learners who want to follow along in real time. Nearly 18,000 undergraduates call Wayne State’s midtown Detroit campus home. This public research university delivers education in over 300 subject areas across all academic disciplines. Distance learners at WSU can complete several degrees entirely online. WSU’s online offerings include a bachelor’s in social work and master’s degrees in criminal justice, library and information science, and theatre and dance with a teaching artistry concentration. Educators may also be interested in WSU’s online master’s programs in instructional technology or career and technical education. Finally, distance learners can also pursue a variety of online certificates, in education, business, and more. All online courses are facilitated through the Blackboard learning management platform, and taught by campus-based faculty. Classes follow the traditional semester calendar. Courses are taught asynchronously, though some instructors may occasionally require timed online attendance. Lying south of Ann Arbor and slightly west of Detroit, Eastern Michigan is home to nearly 18,000 undergraduate students. Campus-based students can pursue one of 200 degree programs across five academic colleges. For distance learners, EMU offers 20 online programs that lead to bachelor’s degrees, master’s degrees, or graduate certificates. Distance learners can pursue degrees in a range of popular disciplines, including education, engineering, or applied healthcare. EMU administers its online courses through the Canvas distance learning management platform, and classes follow a traditional semester calendar. Distance learners who are eligible to attend EMU enjoy in-state tuition rates, regardless of their home state. This online college in Michigan also offers prior learning assessments where applicable. Cornerstone University, located in Grand Rapids, is a private Christian college that offers undergraduate, graduate, and seminary programs to its 1,250 traditional students. This theologically conservative college builds each of its programs on a foundation of general education and biblical study, regardless of major. These values extend to CU Online, the university’s distance platform. Here, students can pursue two associate degrees, and four bachelor’s degree-completion programs. Graduate students can also earn one of 12 available master’s offerings. Finally, distance learners may also pursue a post baccalaureate certificate in addictions counseling or a doctoral program in education. All CU Online classes are facilitated through the Moodle learning management platform. Course schedules vary, but are generally eight or 16 weeks in length. Davenport is a fully accredited, independent private university. The Grand Rapids-based college is dedicated to helping students succeed, and the school offers programs in health, technology, and business, among others. More than 6,000 students attend classes in Grand Rapids or at one of DU’s 11 satellite facilities; these students may pursue one of 50 programs at the associate, bachelor’s, or master’s level. Recognizing the needs of working adults, DU also offers an extensive online degree platform. Ranging from two-year associate programs to bachelor’s degrees, master’s degrees, and postbaccalaureate certificates, DU’s 48 program offerings stand out among the offerings at Michigan’s online colleges. Online learning at DU is delivered through the Blackboard learning management platform. Most courses are taught asynchronously, though some instructors broadcast their courses in real-time. Adult learners can expect to receive considerable support, including a generous credit transfer policy and school credit for relevant professional experience. Distance learners from out-of-state are eligible for a 33% tuition discount. LTU is a private business school in Detroit. The school offers programs in engineering, architecture, applied science, and technology to its 4,500 students. In addition to its high academic standards, LTU is known for its dedication to technological innovation, and the school was one of the first online colleges in Michigan. Distance learners may pursue one of LTU’s popular graduate degree programs, all of which can be completed in 15-24 months. In LTU’s MBA program, students may concentrate their studies in project management or information technology. Similarly, the information technology program offers concentrations in project management and information assurance. Other online offerings include master’s degrees in architecture or several subspecialties of engineering. All degree requirements can be completed online, with the exception of the on-site critical practice studio element in LTU’s architecture program. All classes are delivered through Blackboard. UM-Flint has been nationally recognized for its affordable, academically rigorous educational programs. Traditional students can pursue one of more than 100 undergraduate and 18 graduate programs. UM-Flint was also a pioneer in distance education, and today the school offers a variety of options for online learners, both for undergrads and graduate students. Undergraduates can pursue three degrees online, including bachelor’s programs in applied science and business administration, along with an RN-to-BSN offering. At the postbaccalaureate level, students can pursue advanced degrees in 10 disciplines, including programs in education, technology, applied healthcare, and business. Six other graduate programs are offered in a hybrid format. Distance courses at this Michigan online college are facilitated through Blackboard. UM-Flint maintains a low 15:1 student-to-faculty ratio. Baker College is an independent private career college that operates 15 campuses across the state of Michigan. Catering to working adults, Baker offers career programs in 150 areas of study, leading to professional certifications, along with associate and bachelor’s degrees. Distance learners can choose from programs in 17 areas of study; Baker Online makes these options available either exclusively online or through hybrid programs. This Michigan online college delivers its online instruction through the Blackboard learning management system; classes follow a traditional semester calendar, and all courses are taught asynchronously. Baker offers distance learners several support services, including an online bookstore, lifetime career advising, and a digital library. Detroit Mercy is a private Catholic institution that delivers higher education programs at the bachelor’s, master’s, and doctoral levels. As a small school, UDM is able to maintain an optimal student-to-faculty ratio, and the average class has just 11 students. While traditional undergraduates can pursue dozens of bachelor’s degrees, UDM’s online education programs are targeted toward graduate students. Nursing professionals enjoy particularly comprehensive offerings, with two-year master’s degree programs available in clinical nurse leadership, health systems management, and nursing education. Non-degree-seeking nurses may opt for one of a handful of graduate certificate programs. For business-minded students, master’s degrees in finance, economics, information systems, and cybersecurity can also be completed entirely online. UDM delivers its classes through Blackboard. While all coursework can be completed online, any required practical experiences must be arranged at a facility approved by the department. A public university in Big Rapids, Ferris State educates about 14,000 students per year on its main campus and at 22 satellite facilities across Michigan. It offers nearly 200 degree programs at all academic levels and across a range of disciplines. Ferris is dedicated to helping all students earn a baccalaureate education, and the school accepts more transfer students than any other four-year college in the state. This institutional goal is also reflected in FSU’s online degree-completion programs, many of which are renowned for their academic rigor. Designed for students who hold an associate degree or its equivalent, these programs lead to a bachelor’s degree in 11 areas of study. Graduate students may pursue online master’s degree programs in business administration, healthcare administration, nursing, or public health. Like many Michigan online colleges, Ferris administers its distance learning platform through Blackboard. While online courses are mostly offered asynchronously, some classes do contain on-site elements, such as a summer lab session or practicum. Oakland serves about 20,000 students per year in the Detroit metropolitan area. This fully-accredited public research institution confers degrees in 130 disciplines. Oakland is particularly notable for its fine arts and performance programs. Oakland has something for almost everyone though, and distance learners can pursue online degree programs at the bachelor’s, master’s, and doctoral levels in nursing, education, or engineering. For working registered nurses, an online BSN degree-completion program is offered as well. Behavioral therapists or educational professionals may be interested in the school’s five graduate certificates in therapeutic subspecialties. Oakland delivers its online instruction through Moodle; most courses are taught asynchronously, but individual instructors may occasionally schedule synchronized meetings. Classes adhere to a traditional semester calendar. This mid-sized public school is home to more than 9,000 students. Traditional students can enjoy its proximity to Lake Superior, along with a variety of rigorous study programs. NMU's global campus is designed for first-time students and working professionals looking to start or complete their degree. Designated programs may be taken entirely online or in a hybrid format that blends distance learning and traditional classes. Distance programs include management, applied workplace leadership, clinical laboratory science, loss prevention management, and RN-to-BSN completion. NMU also offers a variety of online master's degree options, including an MPA program. NMU's Global Campus allows students to seamlessly transfer in credits earned at other universities. Grand Valley State University operates a central campus in Allendale and satellite campuses throughout Michigan. The school is the fifth-largest college in the state in terms of student enrollment. GVSU is also one of the best online colleges in Michigan, offering more than 40 undergraduate, graduate, and doctoral degrees online in education, public service, health, nursing, and the arts and sciences. Each program varies in delivery method, with some taking place entirely online in an asynchronous format and others using a hybrid model that blends on-campus and online coursework. GVSU also offers individual courses from other programs online. GVSU is transfer-friendly, honoring transfer plans with all Michigan community colleges. GVSU generally admits transfer students who have earned a minimum GPA of 2.5 at their previous school. As a public university, GVSU charges out-of-state online students a higher tuition rate than in-state students. Grace Christian University delivers a Christian education in a format that’s designed for busy adults. This fully accredited private school in Grand Rapids builds every program’s curriculum on a foundation of general education, Biblical and theological study, and vocation. Outside of the traditional classroom, Grace also makes its associate, bachelor’s, and master’s degree programs available via accelerated evening classes or distance education. The school’s two-year and four-year online programs in leadership and ministry, business, or human services can be completely entirely online. Adults who have already completed an associate degree or its equivalent can elect to transfer credits to earn their bachelor’s degree online. For those aspiring to careers in pastoral services, the master of arts in ministry is also offered online. Jackson College, a community college, prepares students to transfer to four-year universities in Michigan and is one of the best online schools in Michigan. JC offers 10 associate degree and certificate programs online. Each program delivers coursework asynchronously through Moodle. Online programs include accounting, business administration, and sonography. Most programs are taught completely online; the sonography programs include a single, on-campus science course and a practicum at a health care institution. Students can access online courses at other Michigan community colleges through the Michigan Community College Virtual Learning Collaborative. JC offers the cheapest tuition rate to students who reside in Jackson County. Out-of-state learners pay a higher tuition than students who live in state. If you want to qualify for a range of high-paying job opportunities, earning a college degree is key. When deciding where and what you want to study, you may end up weighing both in-state and out-of-state schools. If you are from Michigan, there are many advantages to attending college in your home state. Sticking close to home can qualify you for in-state tuition and help you build a network of regional professional contacts. You may also benefit from your school's name recognition on the local job market, and you'll be relatively close by if you need to occasionally visit campus. When researching programs, be sure to consider our list of the most affordable online colleges in Michigan. All of the schools in this list are accredited, and our rankings highlight the colleges that offer the best blend of affordable tuition and return on investment. The University of Michigan - Ann Arbor is one of the largest colleges in Michigan. The university offers a variety of online certificate programs, associate degrees, bachelor’s degrees, and graduate degrees. Some of the more unique programs include a dental hygiene degree completion program, a master of engineering (in manufacturing, systems engineering and design, energy systems engineering, or automotive engineering), and a master’s in health management and policy. These programs can range from 15 credit hours to 60 credit hours, depending on the degree type and departmental standards. In addition to these full-fledged programs, the University of Michigan also offers online skills courses through MichiganX. While these do not culminate in a degree, they teach students valuable skills that can help them in their professional development. Most MichiganX courses are free but students may pay an optional fee to obtain an official certificate corresponding to the courses they’ve taken. Located in Rochester, Oakland University is a public academic institution that offers 132 bachelor’s degree programs and 124 graduate degree programs, including 15 fully online programs. Online programs are offered in the departments of nursing, education, engineering, and health sciences. For registered nurses who already have an associate degree, OU offers a bachelor of science in nursing degree completion program. OU also has a bachelor of science program in environmental health and safety, a 125-credit-hour degree that can be completed in four years. All students enrolled in an eligible online program with OU pay in-state tuition, regardless of residency, making it one of the most affordable online colleges in Michigan for out-of-state students. The University of Michigan in Dearborn offers 18 fully online master’s degree programs, including a master’s in business administration, master’s in automotive systems engineering, master of arts in educational technology, and a master of science in finance. Completion requirements vary depending on the particular degree but usually range from 36-48 credit hours. In addition to these fully online degrees, students enrolled in traditional on-campus programs may register for online courses for a hybrid learning format. Out-of-state students seeking to enroll in an online program at the University of Michigan should consult the distance education laws of their respective states. Tuition costs may vary depending on the University of Michigan’s status within each state. Michigan Technological University is a regionally accredited academic institution located in Houghton. Michigan Tech offers a selection of online master’s, doctorates, and graduate certificate programs. Interesting degrees include a master of science in integrated geospatial technology, a master of science in medical informatics, and a PhD in mechanical engineering. While the school does not offer fully online bachelor’s degrees, Michigan Tech provides a slew of online undergraduate courses that can be used toward the completion of an on-campus degree at Michigan Tech or another university. Undergraduate online courses can also count toward a dual enrollment program for high school students. Michigan State University, located in East Lansing, is a public research university and a pioneer in educational programs for scientific agriculture, hospitality, packaging, and supply chain management. MSU offers distance learning opportunities through its fully online and hybrid graduate programs and certificates. Fully online programs include master of science degrees in criminal justice, food safety, packaging, and supply chain management. Most of these master’s programs require the completion of 30 credit hours and a thesis or final examination. In addition to these for-credit courses and programs, Michigan State University also offers non-credit courses for continuing education or personal enrichment purposes. Located in Traverse City, Northwestern Michigan College is a community college that offers associate degrees and professional certificates. While NMC does not have any fully online degrees, it has a catalogue of online courses that can be used in the fulfillment of degree requirements both at its campus and at other universities. Some of these courses require labs or monitored examinations and are considered hybrid classes. Roughly half the students at NMC enroll with the intention of transferring to a four-year college to complete a bachelor’s degree. NMC’s online courses are not currently available to residents of California, Florida, or Massachusetts. Siena Heights University is a Roman Catholic academic university founded in 1919 by the Adrian Dominican Sisters. The main campus is located in Adrian and there are several satellite campuses located throughout the state, including Lansing and Kalamazoo. SHU offers several fully online bachelor’s programs and hybrid graduate programs. Eight online undergraduate degrees are available, including nursing, applied science, and accounting. Students may also obtain undergraduate minors in several fields, including behavioral science, healthcare management, information technology, and professional communication. One of the largest colleges in Michigan, Wayne State University is a public research university located in Detroit. In addition to its many on-campus courses, Wayne State also offers fully online undergraduate, graduate, and certificate programs as well as hybrid degrees with online options. Interesting online degrees include a bachelor’s degree in social work, a master of education in learning design and technology, and a master of library and information science. Wayne State University participates in the Great Lakes Tuition Policy and Good Neighbor Policy that allows students from neighboring states and Canadian provinces to pay only slightly more than in-state tuition. These policies make the school not only one of the most affordable online colleges in Michigan, but also in surrounding areas. Central Michigan University is a public research university located in Mount Pleasant. The school offers several fully online degree programs, including nine bachelor’s degrees, 13 master’s degrees, and three doctorate degrees. Online undergraduate majors include early childhood development and learning, fashion merchandising and design, political science, and psychology. CMU also has an accelerated online bachelor’s to master’s program where certain bachelor’s degree credits will also count toward a master’s degree. Courses are offered in eight-week, 12-week, and 16-week formats. The CMU online global campus offers 20 scholarships and awards, which combined with federal aid and other scholarships, make it one of the more affordable online colleges in Michigan. The University of Detroit Mercy is the largest Roman Catholic university in Michigan. In addition to its on-campus offerings, the UDM provides many online education options, including eight fully online master’s degrees and six graduate certificates. These online programs are available to students anywhere in the world with internet connection. However, there are still some restrictions for residents in the United States. Online programs from UDM are currently unavailable to students in Alabama, Arkansas, Connecticut, District of Columbia, Maryland, Massachusetts, Minnesota, Oregon, Puerto Rico, Tennessee, Utah, and Wisconsin. Located in Marquette, Northern Michigan University is a public university with a selection of fully online associate, bachelor’s, and master’s degrees. Undergraduate majors include criminal justice, applied workplace leadership, clinical lab sciences, loss prevention management, and psychology, all of which require the completion of 120 credit hours. Online master’s degree requirements range from 32 to 36 credit hours followed by the completion of a thesis or capstone course. As a four-year college, Northern Michigan University accepts credit transfers from advanced placement exams, dual enrollment courses, two year colleges, or other four year universities. A maximum of 64 transfer credits may be applied to a degree at NMU. This flexibility of credit transfers and financial aid options make this one of the more affordable online colleges in Michigan. Lawrence Technological University is a private four year university located in Southfield. In addition to its on campus offerings, LTU also provides a selection of fully online master’s degree programs in architecture and design, engineering, and management. Program requirements range from 30 to 36 credit hours and can take from 15 to 24 months to complete. Admission to most of these master’s programs require the completion of a bachelor’s degree from a regionally accredited university, an undergraduate GPA of 3.0 or higher, and a sufficient score on the appropriate standardized test. Spring Arbor University is an Evangelical Christian university that offers more than 70 undergraduate degrees and four graduate programs on its main campus. The university offers seven online master’s degrees and three online bachelor’s degrees. Online undergraduate programs include organizational management, social work, and nursing. These programs range from 41 credit hours to 124 credit hours and generally take two to four years to complete. The school also offers seven graduate programs, including education, business administration, and reading. These master’s programs generally require 36 credit hours and take 18 to 24 months to complete. Grace Christian University is an evangelical college located in Grand Rapids. The school is accredited by the Higher Learning Commission and the Association for Biblical Higher Education. Grace Christian University offers a variety of fully online degree programs, including associate degrees, bachelor’s degrees, and a master’s program. Its primary undergraduate majors are leadership and ministry, business, and human services. In addition to these majors, undergraduate students may take online courses in criminal justice, psychology women’s ministry, youth ministry, and adult development. Grace Christian University also offers a master's degree in ministry. Many of these online programs are designed for older students and working professionals. Grace Christian University is unique among online colleges in Michigan for its smaller class sizes and Christian focus. Northwood University is a private university with campuses across the United States, including one in Midland, Michigan. The school is accredited by both the Higher Learning Commission and the North Central Association of Colleges and Schools. While NU offers degree programs in a variety of disciplines, its fully online degree programs are all business-related. NU offers 11 concentrations within its online bachelor’s of business administration program, including an optional minor in operations and supply chain management. These degrees typically require 123 to 126 credit hours and take four years to complete. NU also offers online master’s of science programs in finance and organizational leadership. Rochester College is a four-year Christian liberal arts college accredited by the Higher Learning Commission. In addition to a variety of traditional degree programs, RC offers accelerated bachelor degree programs online, on campus, or in a hybrid format that can be completed in 16 to 24 months. Fully online bachelor degree programs include early childhood studies, Christian ministry, strategic leadership, and a BSN completion program. RC also offers an online and on-campus hybrid master of religious education, a 36-credit-hour program that combines 24 distance education hours with 12 on-site hours. The Michigan Jewish Institute is a private Jewish college located in Detroit. The institution specializes in computer information systems, business, and Judaic studies. Many of the school’s degree programs can be completed online, including an associate in computer information systems. MJI has many international students serving the Jewish community abroad as well as within the United States. MJI is nationally accredited by the Accrediting Council for Independent Colleges and Schools and has an incredibly low tuition rate, making it one of the most affordable online colleges in Michigan. Eastern Michigan University is a public university located in Ypsilanti. EMU offers 19 fully online programs, including bachelor’s degrees, master’s degrees, and graduate certificates. Notable programs include educational psychology, dietetics, online teaching, and learning technology. Online undergraduate degrees typically have major requirements of 58 to 72 credit hours while master’s programs range from 30 to 36 credit hours. EMU is a participant in the State Authorization Reciprocity Agreement, which means that students living in any SARA state may enroll in EMU online programs or courses without any additional authorization. Ferris State University is a public university located in Big Rapids. Unique online undergraduate programs include integrative studies, respiratory therapy, and allied health science. Many of the school’s bachelor’s degrees are designed for students who already have an associate degree in a similar field. FSU participates in the Michigan Transfer Agreement, which means general education requirements can be easily transferred from one participating Michigan institution to another. FSU’s website has a search engine of scholarships offered by the school as well as external scholarships. The University of Michigan in Flint is one of UM’s satellite campuses. UM-Flint offers five fully online undergraduate degree programs, including applied science, business administration, marketing, nursing, respiratory therapy, and substance use treatment and intervention. These programs consist of 120-124 credit hours and can be completed in four years. UM-Flint also offers nine fully online master’s programs, online professional certificates, and eight hybrid (online and onsite) graduate programs. Graduate degrees usually require 30 to 36 credit hours and can be completed in one to two years. Saginaw Valley State University has over 90 undergraduate majors of study and 15 graduate degree programs. SVSU is accredited by the Higher Learning Commission of the North Central Association of Colleges and Schools. While SVSU does not offer a fully online degree program, the school offers hybrid programs such as the RN to BSN degree completion program, which combines both online and onsite courses. The school also offers a variety of non-degree online courses through the Office of Continuing Education and Professional Development. Baker College is a private college with campuses throughout the state, including the main campus in Flint. Baker College offers dozens of online undergraduate and graduate degrees, including in business administration, education, engineering, health science, information technology, nursing, and social science. Some of the school’s more unique online degree programs include a bachelor of science in game software development, a certificate in welding, and a hybrid law enforcement academy program. 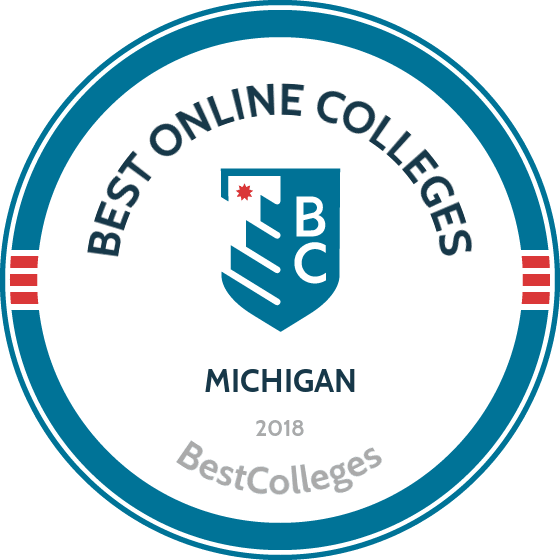 Baker College recently earned a Quality Scorecard Exemplary Endorsement from the Online Learning Consortium, showing its excellence among online colleges in Michigan. Located in Grand Rapids, Cornerstone University is a non-denominational Christian university accredited by the Higher Learning Commission of the North Central Association of Colleges and Schools. The school provides fully online degrees and certificates in the fields of business, counseling and psychology, ministry, human services, and education. Online undergraduate programs include human services and ministry leadership. Non-degree programs include a graduate addictions certificate and a TESOL graduate diploma. Andrews University is a Seventh-Day Adventist university located in Berrien Springs. Andrews University is accredited both by the Adventist Accrediting Association. Online undergraduate programs include associate degrees in Christian discipleship, business, religion, communication, and general studies. Online associate degrees require roughly 60 credit hours, while bachelor’s degrees require approximate 124 credit hours. AU also also offers a variety of online graduate programs in business, education, and healthcare. Davenport University is a private nonprofit academic institution located in Grand Rapids. DU offers fully online associate degrees, bachelor’s degrees, master’s degrees, and graduate certificates. Its associate programs typically require 60 credit hours and can be completed in two years. Bachelor’s programs include human resource management, sport management, cyber defense, and health information management. Bachelor’s programs typically require 120 credit hours and take four years to complete. DU also has master’s programs in the fields of business, technology, and healthcare. Like many postsecondary institutions in the U.S., Michigan's schools have recently expanded their online offerings to accommodate increased demand for distance learning options. This is particularly important in Michigan, a state with a reputation for expensive tuition. In-state tuition in public 4-year schools has increased by 19.7% since 2008, and the average tuition rate in Michigan is among the highest in the nation. In response to rising costs, college students have increasingly turned towards online education options, where tuition and attendance costs are lower. Michigan is a leader in online education. In 2006, Michigan became the first state requiring students to take an online course as part of their postsecondary curriculum. Michigan's Board of Education remains committed to expanding online education, believing that the platform is a useful vehicle for increasing enrollments among working adults in the state. More than 90 schools in the state offer some form of online education, from basic classes to full degrees. The recent expansion in online offerings comes at the end of a long period of slow enrollment growth in Michigan; while the country as a whole saw enrollment rise 30% over the past ten years, Michigan's enrollment rate only grew by 10%. With increasing online options, state education officials are hoping that enrollment increases significantly over the rest of the decade and beyond. Browse our list of the best online colleges in Michigan for more insight into distance learning programs in this state. In Michigan, employment growth in this profession is strong. According to the Michigan Department of Technology, Management & Budget, long term projections show an increase of 17% in the total number of jobs between 2014 and 2024. Wages increased by 5% from 2011-2016. What were the top careers in Michigan in 2016 for people who had a degree in registered nursing? Data source: Michigan Department of Technology, Management & Budget, Bureau of Labor Statistics. Data may not be available for every year. Employment growth in this profession in Michigan is strong. According to the Michigan Department of Technology, Management & Budget, long term projections show an increase of 15% in the total number of jobs between 2014 and 2024. Wages increased by 9% from 2011-2016. In Michigan, what were the top careers in 2016 for people who had a degree in business administration and management? In Michigan, employment growth in this profession is strong. According to the Michigan Department of Technology, Management & Budget, long term projections show an increase of 30% in the total number of jobs between 2014 and 2024. Wages increased by 5% from 2011-2016. In Michigan, what were the top careers in 2016 for people who had a degree in marketing/marketing management? In Michigan, employment growth in this profession is strong. According to the Michigan Department of Technology, Management & Budget, long term projections show an increase of 25% in the total number of jobs between 2014 and 2024. Wages increased by 9% from 2011-2016. What were the top careers in Michigan in 2016 for people who had a degree in Accounting? In Michigan, employment growth in this profession is strong. According to the Michigan Department of Technology, Management & Budget, long term projections show an increase of 15% in the total number of jobs between 2014 and 2024. Wages increased by 9% from 2011-2016. In Michigan, what were the top careers in 2016 for people who had a degree in finance? The methodology behind our rankings is grounded in statistical data and a few consistently applied guiding principles, including academic quality, affordability, and online competency. Our 2018 rankings reflect the most recent data available from the Integrated Postsecondary Education Data System (IPEDS) and College Navigator, both of which are hosted by the National Center for Education Statistics. Our goal is to objectively assess relative quality based on academic outcomes, affordability, and the breadth and depth of online learning opportunities. Click through for a full review of our Rankings Methodology. Schools featured in our rankings demonstrate a commitment to high-quality education for their students. Quality is measured and weighted through various data points that are specific to each ranking topic. Each methodology drives proprietary calculations, which are grounded in statistical information, and developed to recognize academically robust, affordable colleges and programs. Sponsored school listings are separate, paid advertisements and are clearly marked with a "SPONSORED" tag to distinguish them from editorially ranked schools. Our school rankings are editorially determined, independently vetted, and are not influenced by schools that pay for advertisements. For questions regarding our rankings or sponsored schools, please email us at contact@bestcolleges.com.